Similarly to conditional Task coloring options it's also possible to define a color for each projects' custom value that you've added. 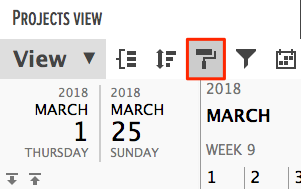 Using different color schemes on data fields can be handy for getting overviews by custom criteria (f.e project statuses, phases, locations etc). To start using color schemes feature with predefined values, you must first create 'List of values' project custom data fields and enter your values. Add different values you wish to add colors to. For example different project statuses. Click 'Apply' upon completion. You can change the colors later. 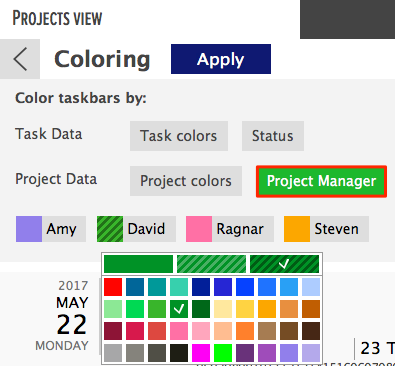 Make sure you aren't selecting the same colors that are selected for the custom data fields of tasks to avoid any confusions. You can edit the colors or the coloring set up that is being displayed from the same menu. Did not find the answer to your question regarding conditional project coloring?